A striking white, wooden Christmas tree, it’s just the thing to add a bit of Christmas cheer to any room. At 20” tall, it’s ideal for the minimalist. 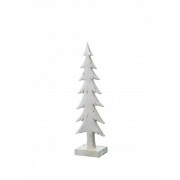 This plain, white wooden tree is simple, elegant and fuss free.